Mozilla this week discussed its goals for Firefox 4, the next major upgrade of its open source Web browser. The new version of Firefox will focus on features like improved speed, a simpler user interface, and HTML 5 technologies, but Monday's talk was more about discussing broad goals rather than actual features. (Don't new browsers always focus on speed?) 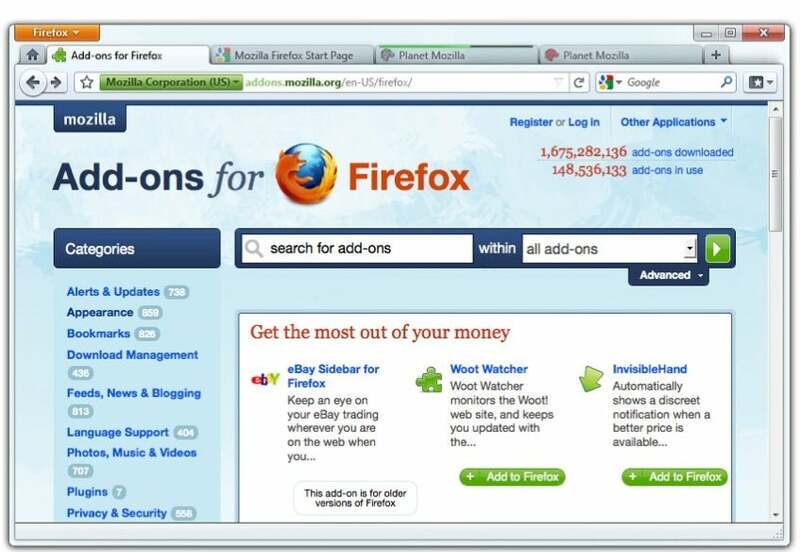 Nevertheless, Mozilla did discuss some features being considered for Firefox 4, and even provided a few sneak peeks. Here's a quick look at some of the more interesting features that may show up in the next version of Firefox 4. Just keep in mind these features are only being considered and tested right now, and may not make it into the final, or even beta versions, of Firefox 4. Mozilla is trying to do away with as many unnecessary buttons and other interface items as possible in Firefox 4. In the interface window Mozilla showed off on Monday, the home, reload, and stop buttons had all been removed. Instead, the home button was given its own tab, the reload button was placed in the browser entry bar, and the stop button (which prevents a page from loading) was completely gone. The mock-up also placed a favorites button to the immediate left of the URL entry bar, similar to Google Chrome. One idea that has been in development for months is to remove the home button from Firefox, and replace it with a home tab that can't be closed and would sit on the far left of the browser window. The idea is for this tab to house your start page so you can always return to it. Late last year, it looked like this page might contain some social networking features like status update widgets from social networks, RSS feeds, and other personalized content. However, current plans are not clear about whether the new Home Tab would include dynamic content or just be home to the user's selected home page like Google, Windows Live, or Yahoo. Firefox 4 may also have Web application tabs that would operate similarly to the home tab, but be dedicated to specific Web apps such as Gmail, Windows Live Calendar, and Twitter. This is far from confirmed yet, but for several months now Mozilla has been toying with the idea of having the tabs in Firefox 4 point up instead of down, similar to how tabs appear in Google Chrome. This would be a great way to maximize browser window real estate, and minimize user interface elements such as the application window, buttons, toolbars, and so on. One feature that is already showing up in nightly builds of the forthcoming Firefox 3.7 (formerly known as Firefox 3.6.4) is a switch-to-tab feature that makes it easier to navigate multiple tabs. Let's say you have 15 browser tabs open; you're currently on a tab from The Wall Street Journal, and you want to navigate to an open tab at CNN.com. All you have to do is start typing the 'CNN' into the address bar, and Firefox will give you a choice in the drop down menu to either navigate to your open CNN tab or open a new tab at CNN.com. Firefox 4's permission dialogs may also be changing from pop-up windows and drop down alerts to simple dialog bubbles that drop down from the URL bar. The advantage to this change would again be a simpler, cleaner navigation that would be less intrusive to the user than persistent pop-ups that follow you every time you switch tabs. But it should be noted the new dialog bubble wouldn't behave all that differently from the dialog drop downs used for passwords and other warnings in the current version of Firefox (3.6.3). Mozilla also hopes to make startup times faster for Firefox by removing another set of annoying pop-ups--namely, dialog boxes for Firefox and add-on updates that occasionally appear when you startup the browser. These pop-ups, while they can be ignored, prevent you from using Firefox while updates are being installed. Mozilla is hoping that in the future, Firefox will get its updates in the background, where new versions of Firefox would be installed while the browser is running, again just like in Google Chrome. However, this appears to be a long term goal for Mozilla, and the first versions of Firefox 4 may not include background updating. Firefox 4 sounds like it may have some interesting new additions for users, but I couldn't help noticing that a lot of these proposed features--tabs on top, background updates, simpler user interface--were clearly inspired by Google Chrome. It will be interesting to see just how closely the two browsers resemble each other once Firefox 4 is released. Currently, Mozilla is hoping to release beta versions of Firefox 4 this summer, possibly as early as June. If you'd like to see Mozila's 45-minute presentation on Firefox 4, you can find it here . But to watch it you'll need to be running a browser that fully supports HTML 5 such as Google Chrome or Firefox.